Klepierre, specialised leader in Shopping Centres in Europe, has trusted in the Chapman Taylor architecture studio and Project Management company Gleeds Ibérica for the design and execution of the latest renovation of the Plenilunio Shopping Centre. KRION was one of the materials selected for this project. 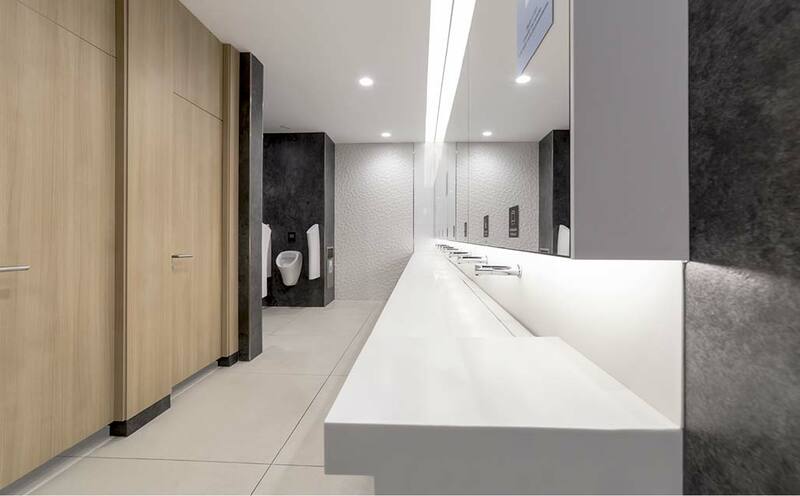 The communal areas of the shopping centre will have the solid surface from PORCELANOSA Group, KRION, for the transformation of units and the coverings of lifts, among other uses. With this new renovation, the Plenilunio Shopping Centre, a point of reference for FASHION and LEISURE in Madrid, restates its commitment to offering the best and most comprehensive service to its clients, creating a fun, original atmosphere so that their visit becomes a unique and dynamic experience. The properties of KRION make it an ideal material for high transit areas, with easy cleaning, the possibility of repairs, and maintenance of the material in the same state as the day it was installed. These and many other characteristics, along with the international standing of the solid surface from PORCELANOSA Group, KRION, convinced Klepierrre, Chapman Taylor and Gleeds Ibérica to create the spectacular 4 metre countertops and exterior coverings of the panoramic lifts with the material, with work carried out by Murcian transformation company Galian Solid Surface. We can also find bathrooms with infrared electronic systems from Noken.